Coach Nathan Buckley may be forced into at least two changes ahead of Collingwood's round 21 clash with Port Adelaide next weekend. Midfielder Levi Greenwood has been reported by the match review panel for a third-quarter collision with Essendon's Zach Merrett. Levi Greenwood's collision with Essendon's Zach Merrett headlines AFL Media's top five talking points to stem from Collingwood's loss to the Bombers. Greenwood’s best football sees him use his solid frame to advantage, winning the hard ball around the stoppages and breaking clear onto his left boot. A hard-nosed onballer, the South Australian had played 52 games in his first five years at North Melbourne before enjoying a breakout season in 2014. After years of consistent performances for Werribee in the VFL, where he averaged 25.1 and 20.8 disposals in 2012 and 2013, Greenwood took his game to a new level as the Kangaroos charged towards the 2014 Preliminary Finals. 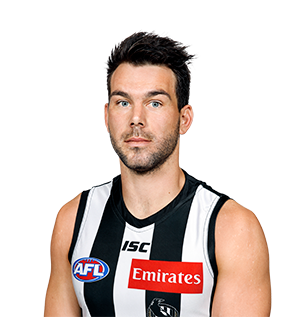 Injury hampered his first year at Collingwood, yet 21 games in 2016 solidified his place in Collingwood's starting 22. Often used as a tagger or defensive midfield, Greenwood rarely makes friends from opposition teams, but is highly rated by the Magpies’ playing group and coaching staff alike. Opposition midfielders beware – Levi Greenwood is coming for you. The onballer full of grunt was at his best in 2017 playing on some of the best players in the game. The South Australian’s ability to include an offensive touch to a defensively-minded approach was impressive in a number of games – none more so than in round six when he kept Geelong captain Joel Selwood to just 17 disposals in Collingwood’s 29-point victory. Greenwood continued to impress throughout the year and strung together 13-straight games between his round three opener and a round 18 clash with Essendon. It was in this match in which a hit on Bombers star Orazio Fantasia saw Greenwood suspended for a week. He returned, but injured his knee in Collingwood’s round 20 win over North Melbourne. Restricted to just eight senior games in his debut season at the Holden Centre, Greenwood was a much more familiar sight on the field in 2016. Having never played in round one in his eight seasons in the AFL, the 27-year-old experienced what may have been an unfamiliar feeling when he began the season with the Magpies in round one. While team and individual success varied in the early stages of the season, Greenwood hit a purple patch in the middle of the year. Between rounds 10 and 14, the midfielder averaged 12.5 tackles per game. This trend would continue, with only Adam Treloar (139) having more tackles over the course of the season. Greenwood also found a goal-kicking knack which had largely evaded him in the first 80 games of his AFL career. The former Kangaroo kicked 13 majors in the last 10 games of the season, only failing to hit the scoreboard in a round 20 loss to Richmond. 18 goals for the season set a career-high as the tough midfielder provided a vital source of scoring for a Collingwood side with a number of key forwards missing from the starting 22. 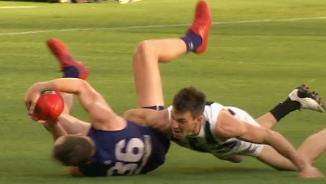 Months of anticipation for the freshly-recruited Greenwood came undone in the final round of the 2015 NAB Cup when the midfielder landed awkwardly in the centre square. The diagnosis of the injury didn’t do the 26-year-old any favours, with a fractured ankle keeping Greenwood out of action until June. Fittingly his return came in the VFL against Werribee, the team he played 26 games for during his six years at North Melbourne. Despite a strong performance against his former side, it wasn’t until two weeks later that Greenwood stood out on a wet Whitten Oval. 25 disposals, 10 tackles and nine clearances proved enough for Nathan Buckley to elevate Greenwood to the senior side for Collingwood’s round 16 clash with West Coast. As he rounded out the season with eight consecutive games, Greenwood quickly became known for playing a tough, compromising run-with role on the opposition’s most dangerous midfielder. Few would forget his fiery clash with Geelong captain Joel Selwood, as Collingwood beat the Cats by 48 points in round 22. After playing just 24 games in the previous three years, Greenwood averaged 25.0 disposals in 22 games, finishing third in North Melbourne’s Syd Baker Medal count. He won 20 or more disposals in 19 of his 22 games, peaking with 34 against Port Adelaide in round three. Greenwood’s crowning glory came against Essendon in the Elimination Final, when he won 32 disposals, laid seven tackles and kicked a goal in North’s thrilling win over one of its staunchest rivals. The 25-year-old’s breakout year was recognised by his teammates, who nominated him for the AFLPA’s Leigh Matthews Trophy. He was also the Kangaroos’ nominee for the Robert Rose Award, recognising the league’s most courageous player, while he also took home the Jason McCartney Jumper Award, as voted by North’s players, and the Supporters’ Player of the Year trophy. For the second successive year, the one-time senior regular struggled for AFL opportunities in 2013, playing just six games despite solid form with Werribee in the VFL. Greenwood was outstanding in a shutdown role on Richmond captain Trent Cotchin and earned two Brownlow votes for his 38-possession game against Essendon in round 21. But the South Australian slipped down North’s midfield pecking order and, with his contract set to expire at the end of 2014, faced a make-or-break season. After establishing himself as a regular senior player in late 2009, Greenwood fell out of favour in 2012, playing just five senior games and none after round 12. The hard-at-it midfielder finished 2012 strongly in the VFL with Werribee, but a foot injury sidelined him during the finals campaign and delayed his start to the pre-season. Greenwood’s best chance of regaining a spot with the Roos in 2013 might come via the run-with role he played so effectively at the start of his career. Suffered a severe ankle injury in the first round of the NAB Cup and did not return until round 10. Although he played every subsequent game until missing the final match of the year through suspension, Greenwood’s interrupted preparation meant he struggled to impose himself on games like he had done towards the end of 2010. Despite missing nine games, he finished 10th at North Melbourne for hard-ball gets (55). Broke into North’s side as a tagger in 2009 and, while he continued to play an accurate role last season, won more of the ball, averaging 18 disposals a game compared to 11 the previous year. His season highlights came in round 14 when he kicked the match-winning goal against the Brisbane Lions and in round 22 when he had a career-high 39 possessions against Melbourne. He was considered likely to be given greater license to win his own ball in 2011. Made his debut in 2009 and, after struggling at half back initially, made a big impression as a run-with midfielder in the last eight rounds, keeping stars such as Carlton’s Chris Judd and St Kilda’s Nick Dal Santo quiet. Has good endurance, a strong body and attacks the ball and his man fiercely. The Roos’ second pick in the 2007 National Draft had a solid season in the VFL with Werribee. He missed several games after a minor bout of osteitis pubis mid-season, but showed good form across half back and, towards the end of the year, in the midfield. The Roos were hopeful that with a good pre-season, Greenwood could play senior football in 2009. 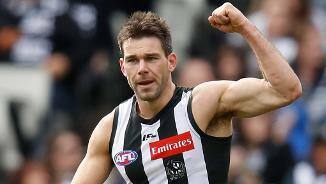 The tough defender arrived with big wraps, with the Kangaroos likening him to club great Glenn Archer. A fierce competitor who is quick, strong overhead and a long kick, Greenwood played 11 senior matches with Port Adelaide in the SANFL and won South Australia’s most valuable player award at the National Under-18 Championships. He was considered a good chance to play senior football in his debut year.